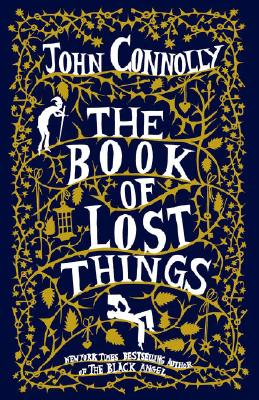 I started reading The Book of Lost Things at Starbucks last Wednesday while my friend was meeting with a west coast client. I had stumbled upon a recommendation for it on Amazon (it turns out that if you buy enough books in one place, the internet starts to use its fancy algorithms to uncover what you like) and it seemed liked a good choice for a cold, blustery day (there’s something about British and Irish writers, I believe, that resonates with strange, off-season weather). I was hooked immediately. This is a YA book, at least in my opinion, even though David, the protagonist, is only twelve (certainly young for the genre). I probably got almost half way through this book while I was waiting for her, its action just pulling me along while the people at the tables closest to me did their best to distract by talking absurdly loudly about the economy and constantly scraping their chairs on the floors. It wasn’t until that night, when I woke up in a sweat, that I realized how deeply disturbing the book really was. In the bright light of day (and I chose to finish it in the bright light of day, I assure you), it seemed like a relatively harmless fairytale – a quest for an angry, grieving boy that leads him into a nightmare world just a slip away from his own. But I’m a grown-up. I know that Loup (half-men/half-wolves) don’t exist. I know it’s not possible to sew the heads of children to the bodies of animals (at least not and keep them alive). I know that the horrors of David’s world are the fears incarnate of a child struggling to overcome the loss of his mother and the displacement within his family by a stepmother and new baby brother. And yet, the brutality of the world David stumbles into, blinded by jealousy of his young, needy brother and furious at his father for letting go of his mother too quickly, is sickening. That he finds strength to stand against such horrors with grace and dignity and wit are remarkable, but for me, I feel soiled by such a place existing even in the imagination. Connolly is an exceptional writer, compelling and supremely gifted at creating truly shocking levels of depravity. This may stem from the fact that this is his first non-mystery/crime/thriller novel, so the bulk of his experience is in exploring the ideas of salvation and morality in context to acts of human brutality. Although I couldn’t find anything to indicate that John Connolly might write more books in this vein (he is still actively publishing a series of crime novels, the latest of which came out last year), he has a real gift for capturing genuine emotion within a fantasy scenario. This book would have scared the bejesus out of me at twelve, but I can imagine it appealing to a huge audience at any age if only because he unflinchingly looks into the most twisted parts of the human psyche without giving up hope. I must try that book. Intriguing.